Photoxor C1 Version 1.4.3 is available now. Upgrade or download for free now from Google Play. 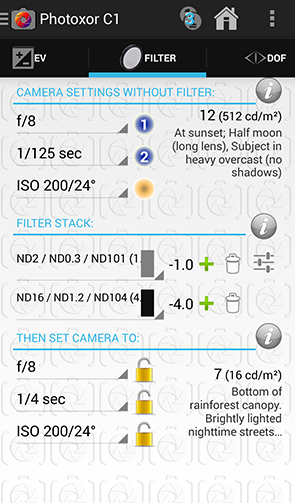 The enhanced Filter screen allows to store your favorite exposure settings. The free version gives you two settings on a click of a button. As part of the Filter Pro add-on you are additionally able to define custom exposure settings for your specific lighting conditions and give them a meaningful scenario name. Select aperture, exposure time and film speed and then perform a 'long' click on one of the blue buttons to store the setting. To recall the stored setting perform a 'short' click. Select aperture, exposure time and film speed and then perform a 'long' click on the golden button. This brings up a dialog to store the current settings. To recall a setting perform a 'short' click, which shows a dialog to select one of the name stored settings. You are also able to add the current setting as a new preset or go to the list of presets. 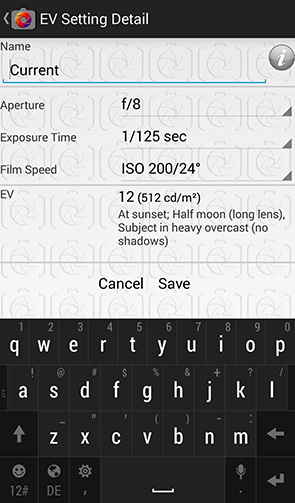 Use this new screen to define your own exposure presets by setting aperture, film speed (ISO), exposure time. Use the 'name' field to identify your individual lighting scenario.